The Poems of Giacomo Leopardi. Translated by Frederick Townsend. The Letters of Lord Nelson to Lady Hamilton. Vol. II. Edward Stewart White. The Westerners. Laura Lee Hope. The Moving Picture Girls Under the Palms. Max Pemberton. The Man Who Drove the Car. The table below shows the results for each of these 50 images. The number 0 indicates a miss; 1 indicates a weak similarity to something in the book or in my life during the book-reading period; 2 indicates a moderate similarity; 3 would have been used to indicate a perfect hit if there had been any. One of the images is marked N/A because it was fulfilled by my seeing something which I had seen many times before and can therefore not be considered specifically precognitive. So 84% of the images are complete misses, without even the slightest resemblance to anything in the books; and there is not a single instance of clear and unambiguous precognition. As for the smattering of ones and twos, it’s impossible to evaluate them in any statistically rigorous manner, since there is no control group and no way of determining how many such results ought to be expected to occur by chance under the null hypothesis that there is no such thing as precognition. However, my common-sense interpretation is that I have not demonstrated any precognitive abilities and that I have failed to replicate Dunne’s results. I will not be doing any more of these book experiments, since my results thus far give me no reason to expect anything interesting to result from them. In addition to detailing his experiments with precognition, J. W. Dunne’s book An Experiment with Time proposes a theory of time — which he calls “Serialism” — to account for his observations. Although it was his precognitive experiences that motivated Dunne to rethink the nature of time, he maintains that his theory is not dependent on empirical evidence of that nature but rather follows directly from certain commonsense propositions about the nature of time which are universally accepted by non-philosophers everywhere. It is never entirely safe to laugh at the metaphysics of the ‘man-in-the-street’. Basic ideas which have become enshrined in popular language cannot be wholly foolish or unwarranted. For that sort of canonization must mean, at least, that the notions in question have stood the test of numerous centuries and have been accorded unhesitating acceptance wherever speech has been made. . . .
[The man-in-the-street’s] conclusions regarding the character of his discovery seem to have been very emphatic in detail, if slightly uncertain in synthesis. His idea was that temporal happenings involved motion in a fourth dimension. That Time had a length, divisible into ‘past and ‘future’. That this length was not extended in any Space that he knew of. It stretched neither north-and-south, nor east-and-west, nor up-and-down, but in a direction different from any of those three — that is to say, in a fourth direction. That neither the past nor the future was observable. All observable phenomena lay in a field situated at a unique ‘instant’ in the Time length — an instant, dividing the past from the future — which instant he called ‘the present’. That this ‘present’ field of observation moved in some queer fashion along the Time length; so that events which were at first in the future became present and then past. The past was thus constantly growing. This motion he called the ‘passage’ of Time. There is a point here worth noting. . . . An examination of the last paragraph will show that many of the words therein [those in boldface above] refer to another Time, and not to the Time stretch over which the passage of the ‘present’ field of observation was supposed to take place. I find this to be a very compelling argument for the existence of a second temporal dimension, a sort of “meta-time.” The only way to avoid the necessity of a “time behind time” is to flatly deny our hypothetical pedestrian’s problematic fourth axiom, insisting that some of the most basic, immediate features of our conscious experience are entirely illusory or even meaningless. It is possible to do this, and I have taken such an approach to time in the past (see my post on “Two solipsisms“), but this is in the end a cop-out, a failure of philosophy to take into account all the relevant data. A theory of time which simply denies that time elapses is unacceptable; better even to give up and write time off as an insoluble mystery than to smooth over its apparent contradictions by simply throwing away some of the explicanda and pretending that the problem has been solved. “Eternalism” as I have presented it in the past is simply dysfunctional philosophy. Later in the book, Dunne illustrates the need for a second temporal dimension by means of an elegant metaphor. He [i.e., our man-in-the-street] symbolized this general conception of Time in several ways; most exhaustively, perhaps, in his sheets of piano music. In these, the dimension running up-and-down the page represented Space, and intervals measured that way represented distances along the instrument’s keyboard; while the dimension running across the page from side to side represented the Time length, and intervals measured that way indicated the durations of the notes and of the pauses between them. But that did not complete the symbol. So far, the page represented merely what we should, today, call a ‘Space-time continuum’. In order to complete the symbol, it was intended that the player’s point of vision should travel from left to right along the model Time dimension, and that the written chords should be played as this moving point, representing the moving ‘Present’, reached them. The key point here is that the motion of the pianist’s eyes over the sheet music is something that cannot be represented in the two dimensions of the sheet music itself. The horizontal dimension of the page represents time — but the motion of the pianist’s eyes takes place in a distinct temporal dimension, in a time behind that time. However, it quickly becomes apparent that two temporal dimensions are no more adequate than one. Suppose we were to create three-dimensional sheet music — the vertical dimension representing space, the horizontal representing time, and a third dimension (represented diagonally below) representing the motion of the pianist’s eyes in meta-time. It’s clear that this still doesn’t capture the necessary element of motion, of time passing. 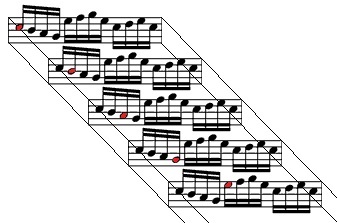 It now contains the idea that the notes must be read from left to right — but only if we assume the motion of the pianist’s eyes in the third dimension which has been added to the score. Modeling that motion would require the addition of a fourth dimension, and so on ad infinitum. No matter how many dimensions of time, meta-time, meta-meta-time, etc. (I may as well adopt Dunne’s more convenient terminology and call them T1, T2, T3, etc.) we add to the diagram, the element of motion is still absent. We still have nothing but a static “space-time continuum” — eppur si muove! Somehow the idea of motion and the “moving present” must be modeled, and yet it seems impossible to do so. Dunne proposes that the problem can be solved by accepting an infinite number of temporal dimensions. For most purposes we need only concern ourselves with a few of these, but the theory implies that, however many temporal dimensions we may include in a given model, there is necessarily another such dimension behind it, one which cannot be depicted in the model. I’m not really satisfied with this model, in which each dimension passes the buck to the next, and motion or change is never actually modeled or explained. Nevertheless, given the inadequacy of every other model of time of which I am aware, I am willing to entertain it. Dunne maintains that, in addition to dealing with the problem of motion, his theory of time, Serialism, also sheds light on a number of other thorny philosophical problems. Near the end of his book he lists his theory’s advantages. Serialism discloses the existence of a reasonable kind of ‘soul’ — an individual soul which has a definite beginning in absolute Time — a soul whose immortality, being in other dimensions of Time, does not clash with the obvious ending of the individual in the physiologist’s Time dimension, and a soul whose existence does not nullify the physiologist’s discovery that brain activity provides the formal foundation of all mundane experience and of all associative thinking. It shows that the nature of this soul and of its mental development provides us with a satisfactory answer to the ‘why’ of evolution, of birth, of pain, of sleep, and of death. It discloses the existence of a superlative general observer, the fount of all that self-consciousness, intention, and intervention which underlies mere mechanical thinking, who contains within himself a less generalized observer who is the personification of all genealogically related life and who is capable of human-like thinking and prevision of a kind quite beyond our individual capabilities. In the superlative observer we individual observers, and that tree of which we are the branches, live and have our being. But there is no coming ‘absorption’ for us; we are already absorbed, and the tendency is towards differentiation. Its proof of the unity of all flesh in the Superbody and of all minds in the Master-mind supplies the logical foundation needed by every theory of ethics. It accounts for dreams; it accounts for prophecy; it accounts for self-consciousness and ‘freewill’; while, in its disclosure of the relations between the general and the individual fields of presentation, it provides the first essential to any explanation of what is called, loosely, ‘telepathic communication’. It does not contradict either modern physics or modern physiology. A theory which can achieve all this is not lightly to be set aside. I will admit that, after my first reading of Dunne’s book, I do not properly understand the reasoning behind most of these points — and I’m not sure whether this is because I am not bright enough to “get it” the first time around or because Dunne’s ideas are crazy. (Certainly his theory of time, though apparently quite popular in its day, has since been rejected and forgotten by both the scientific community and the general public.) It is my intention to go through Dunne’s book a few more times in my plodding way until I am confident that I understand him, and then to evaluate the plausibility of his theory. So expect future posts on this topic — but don’t expect them too soon! I’ve just completed another precognition experiment, in which I tried to obtain precognitive images of what I would read in the novel The Moving Picture Girls Under the Palms, by Laura Lee Hope (selected at random using Gutenberg’s random book feature). I got my precogs on May 15 and finished the novel on May 20. Not a single one of the ten precogs “came true” either in the novel or in my extraliterary life. The closest thing to a hit — and it’s not really very close at all — was the 9th item on my precog list, “plaid skirt blowing up — shoe stuck in the mud, coming off foot.” There is a scene in the novel in which one of the male characters gets stuck in quicksand, and the titular moving picture girls tear their skirts into strips in order to make a rope to pull him out. Aside from the juxtaposition of a skirt being destroyed and something being stuck in wet earth, all the details are different. The skirts in the novel are not plaid but khaki, and the man does not lose his shoe. In one of the English classes I teach, the students are just starting to reach the level where they can read relatively simple novels, so I assign them a chapter a week of some novel, and one of our classes each week is devoted to discussing the chapter they’ve just read. Because of their limited English proficiency, and because they are housewives who are studying English mainly so as to be better able to help their children learn it, we generally read children’s stories. Currently, we’re working on The Lion, the Witch, and the Wardrobe. Generally our weekly discussions revolve around questions of vocabulary, grammar, and usage — but this past week we dealt with the 13th chapter, “Deep Magic from the Dawn of Time,” which introduces the central idea of Aslan’s sacrificing himself to appease the law which demands the death of Edmund. All language questions aside, my students found it completely baffling — and I have to agree with them. While I’m a big fan of Lewis’s nonfiction and of the Screwtape Letters, I have to admit that this particular novel has a very poorly constructed plot. In the 13th chapter, it is suddenly revealed that, because of “the Magic which the Emperor put into Narnia at the very beginning,” the Witch has the right to kill anyone who commits any act of treachery. In fact, executing traitors is not only her right but a requirement. She explains that “unless I have blood as the Law says all Narnia will be overturned and perish in fire and water,” and Aslan agrees that this is in fact the case. She also makes it clear that treason is treason, and that whom is betrayed is of no consequence. Anyone who betrays anyone has to be killed, or else the Emperor will destroy the entire country. The implication is that Aslan is unquestioningly loyal to the Emperor and accepts the Deep Magic and its requirements. Why this should be the case is not clear. We might assume that Aslan is unwilling to betray the Emperor because all traitors must be killed by the Witch — but of course later on in the story he does allow the Witch to kill him, so that can’t be his motive. At any rate, for whatever reason, Aslan is completely loyal to the Emperor — and the Witch has a commission from the Emperor to execute all traitors. The Witch should therefore be confident that Aslan will not stand in the way of such executions, and in fact he does not. She confidently confronts Aslan and demands her pound of flesh, and he gives it to her (though of course he contrives to do so in such a way that Edmund is saved). However, just pages earlier, the Witch does not seem so confident that Aslan will stand back and let her do her job. Despite wishing she could keep Edmund alive for a while to use as a bargaining chip, she decides she had better kill him immediately lest he be rescued and she lose her chance. She seems not to realize at this point that, should he be rescued, she can simply demand him back and Aslan will be forced to comply. Instead, she assumes Aslan will stand in the way of the execution. “It will be a long time now [that Aslan is back] before the Stone Table can again be put to its proper use,” said the dwarf. This implies that Aslan will not allow them to use the Table thus — despite the fact that the Witch has a commission from the Emperor to do so and knows that Aslan is unwilling to oppose the Emperor’s wishes. Of course the reason the plot of The Lion, the Witch, and the Wardrobe is incoherent is that it is an allegory of the Atonement, and the Atonement is a mystery. But while some people may find unexplained mysteries acceptable in theology, they certainly don’t make for very good fiction. The whole point of an allegory is to elucidate that which is being allegorized by turning it into a story people can understand — and that Lewis fails to do. This post is probably quite unnecessary, since most everyone these days takes it for granted that of course democracy is better than hereditary monarchy, but I nevertheless want to balance my earlier post on this subject with one looking at the relative advantages of democracy over monarchy — again focusing on the mechanism of succession and its consequences. As before, I will be using king in a generic sense which includes queens, presidents, etc. The king’s blood relatives are his natural allies. Those who stand a chance of becoming king themselves should anything happen to the reigning king are his natural enemies. The system of hereditary monarchy so arranges things that these two groups of people are identical; it intentionally pits family loyalty against ambition. In my previous post, I emphasized the positive side of this — how family loyalty can put a check on the ambitions of potential heirs, thereby strengthening the polity by reducing the number of people who actively seek the king’s downfall. The other side of this coin is that sometimes ambition wins the struggle against family loyalty, turning potential heirs against their own flesh and blood — and then these unnatural monsters come to power, a distinctly unlikely development in a democracy. Democracy produces Nixons and Hitlers aplenty, but only hereditary monarchy can father forth a Nero. Another point in favor of democracy is that mass elections do tend to ensure that kings meet certain very basic standards of competence and normality. Of course many democratically elected leaders are scoundrels, and some of them are relatively incompetent — but I feel pretty safe in saying that the U.S. has never elected a president with a two-digit IQ and never will. Nor do 12-year-olds win elections, or people with serious mental illnesses. Under the hereditary system, though, all of these things are possible — and, given enough time, inevitable. Is there anything in politics more tragic than Marcus Aurelius — who, reign he never so brilliantly, was helpless to escape his fate of being succeeded by Commodus? It wouldn’t have happened in a democracy. In the end, hereditary monarchy makes the same mistake as democracy: it tries to eliminate the need for human choice and human responsibility by having the king chosen automatically by an algorithm. A fundamental rule of politics ought to be no important decisions made by algorithms, all important decisions made by individuals. It can be helpful to take into account such things as family relationships, the voice of the populace, etc. — but no such consideration ought to be allowed to become “automatic,” to make the decision by itself without the mediation of an actual human being. On May 5, just before beginning the novel, I looked at the title page, concentrated on the title, and tried to pick up precognitive images of what the book would contain. I did this until I had a list of ten such “precogs,” all reasonably detailed. I finished the novel on May 15. Of the ten precogs, eight were complete misses, and neither of the remaining two was fulfilled very precisely. My first precog, as recorded in my notebook on May 5, is “man smiling & scratching left side of black mustache.” The novel contains the following sentence: “Jack Graham, his hat on his knees, twisted his little moustache and smiled amusedly.” It refers to a man touching his mustache and smiling, but the other details (color, scratching, left side) are absent. I suppose there are a quite a lot of books that mention someone touching his mustache and smiling, so this match isn’t worth much. The sixth item on my precog list is “a woman (in a white sun hat?) lowering her face (eyes still up) & covering her mouth w/ one hand to hide a smile.” The novel has this: “The little woman’s cheeks burned, and she lowered her head until the sunbonnet hid her face. . . . And she suddenly looked up into Jim’s honest eyes with an imploring gesture.” A few lines later, “She looked up suddenly with a blinding smile.” This match is slightly better than the first one — woman, sun hat, face down, eyes up, smile — but the bit about her covering her mouth with one hand is a miss. So, still nothing terribly impressive or conclusive. I’ll try this with a few more books just for the sake of thoroughness and then call it quits. The mechanism of succession to the throne — and particularly the extent to which it can be predicted and/or influenced — is a very important feature of any political system. I want to look at the effects of these features as they apply to hereditary monarchy on the one hand and to democracy on the other. In a hereditary monarchy, succession is highly predictable. A potential heir is typically known from birth to be a potential heir, and so his education and pre-coronation career can be arranged so as to prepare him for his future responsibilities. Knowing that he will likely be king someday, he can consciously work to acquire the knowledge, skills, and character traits he will need when it comes his time to take the throne. In a democracy, no one can ever be very confident that he will be king someday, and certainly not from an early age. Therefore, a new king is very unlikely to have spent much of his life specifically preparing himself for kingship. In a hereditary monarchy, the order of succession is a given, and there isn’t much you can do to influence it. If you want to be king, there’s not a whole lot you can do to make it happen, short of staging an all-out revolution. If you happen to be a potential heir, you can become king by murdering the sitting king and/or the other potential heirs — but the hereditary system minimizes the temptation to do so by ensuring that the king and the potential heirs are all close blood relatives. In a democracy, the succession is wide open. In theory, anyone can become king. In practice, you become king by influencing the populace to vote for you, which is best accomplished by developing demagogic skills, cultivating connections with people in power, and (especially in a modern mass-media democracy) acquiring enormous sums of money. These secondary goals are, in turn, most effectively reached by being a complete and utter scoundrel. So that’s what future kings spend their time and effort doing — not preparing to be king, but striving to become king; cultivating not the virtues of a king, but the vices of a politician. One corollary of this is that in a democracy, the king is always someone who really, really wants to be king, since you can’t attain the throne without trying very hard to do so. In a hereditary monarchy, kingship is the heir’s fate, a duty thrust on him whether he will or nill. Thus, in a monarchy it is at least possible to have a king who is not power-hungry. It’s not at all clear how that might be possible in a democracy. In a hereditary monarchy, the king serves for life. He cannot predict how long his term in office will last and is therefore motivated to take a long-term view. In a democracy, the king is typically subject to strict term limits. He can predict with a fair degree of accuracy when his term will end, and he is therefore subject to the temptation to kick difficult problems down the road a few years and leave them for his successor to deal with. In a hereditary monarchy, potential heirs are the king’s natural allies — both because they are his blood relatives, and because they typically serve in high positions in the reigning king’s government. They are motivated to help the king succeed. In a democracy, many potential heirs — particularly those not of his “party” — are the king’s natural enemies. Even though many of them also serve in high positions in the government, they nevertheless want the king to fail. Failing that, they want him to seem to the people to have failed. They are motivated to fight against everything the king attempts, to foment discontent among the populace, and to undermine the people’s loyalty to the king and the unity of the polity.